On 10th February 2005 Prince Charles announced his engagement to Mrs. Camilla Parker Bowles. The wedding was scheduled to take place on my birthday 8th April 2005....and I wondered what the chances of obtaining an invitation might be.. This is my story. Whether you are a rabid republican or an insane royalist, no one can deny that the marriage of a future king of Great Britain to his love of 35 years is not an event of historic note! With that thought in mind, I made a conscious decision to apply for the limited tickets for the Wedding of Prince Charles and Mrs. Camilla Parker Bowles. To my surprise, I received a ticket to the viewing parade ground within the precincts of Windsor Castle to watch the Service of Dedication that was to follow their civil wedding ceremony at the Guild Hall in Windsor! 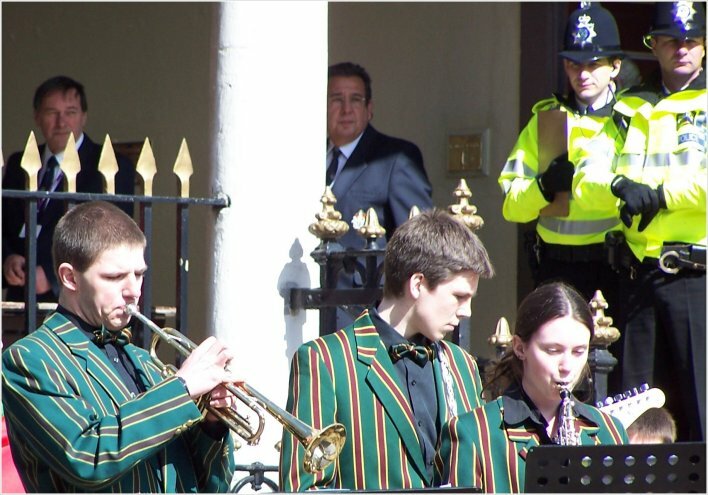 On 9th April 2005 I set the DVD to record the Service Of Dedication, in the hope that some image of myself would also be captured. I set off at 6:00am to take the 150 mile journey from my home to Windsor. 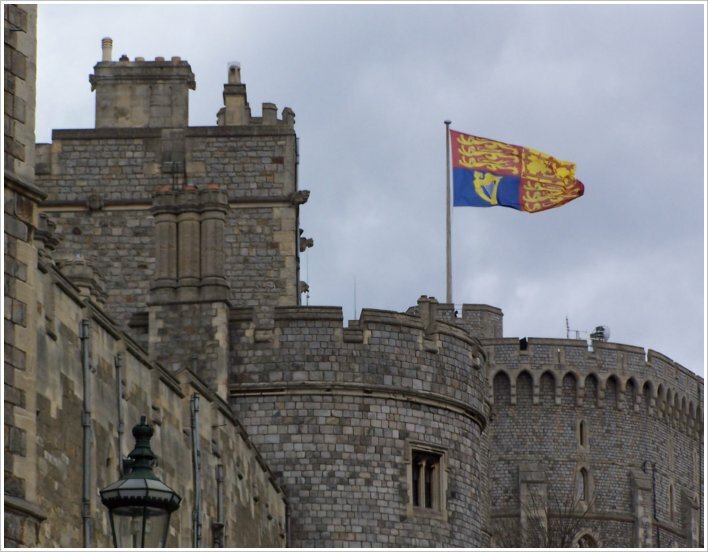 By 9:00am I was there, the 800 year old castle in front of me with the Royal Standard fluttering in the breeze and hundreds of photographers, journalists, police officers and security officials taking up prime positions by security barriers. I pulled my thermal black hat around my ears, and buttoned up my winter coat to keep the chill at bay. Then I walked past the relatively few spectators that had gathered to find the best vantage point. 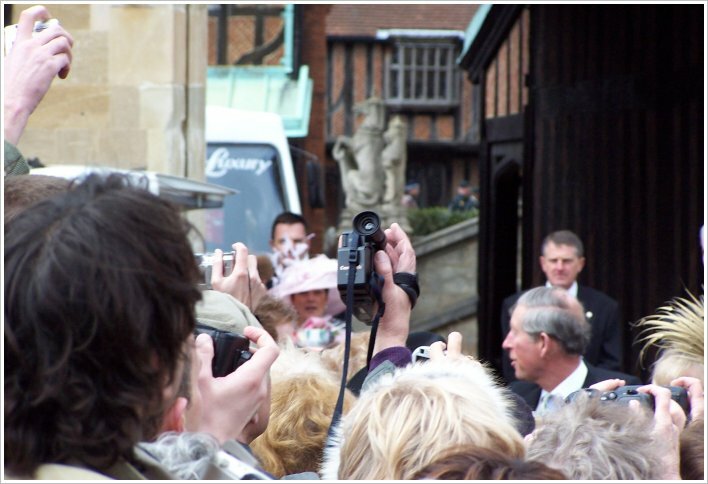 I was determined to take the best photographs of the royal family that anyone had ever seen! I positioned myself next to an American in a prime location just by the barrier directly outside the Guildhall where the happy couple were due to arrive. A mother asked if her three young children could stand in front of me and I reluctantly agreed. Being mean to children does not endear you to your fellow spectators! A man began to light up a cigarette. I gave him my fiercest icy stare but said nothing. I stood and waited... and waited. The sun hid behind the clouds, plunging us into a cold shade and then popped out again to cheers. I glanced at my watch. More than five hours to go! To pass the time I began to take pictures of anything that moved...the police officers, the camera crews, the journalists, the crowd, a plane passing by... I even managed to take an action shot of a horse releasing oats from its body onto the cobbled streets beneath it! Lovely! I watched eagerly as foreign correspondents picked unsuspecting spectators from the crowd, now growing in number, and asked them interesting questions like: "Why are you here today" and "What do you think Camilla will be wearing?" Obviously not the brightest crayons in the box....or perhaps like me they were desperately trying to fill their time. I rehearsed in my head all the intellectual responses that I could give to questions that were never asked of me. I took out my flag and draped it around my shoulders to increase my profile. A camera crew approached me. The camera man asked me " Are you English?" As I nodded, he scowled. " We woz after someone foreign to interview..sorry luv' ". I was tempted to put on my best Spanish accent, but decided against it. Not even I was that desperate to get onto television! Oh to be a star! One hour passed and then two. I plunged my hand into my handbag and pulled out a mangled ham sandwich and carton of juice. As juice dribbled down my chin and a sliver of ham fell onto the floor, I noticed a Sky News camera crew begin interviewing the person beside me. Slowly I allowed my head to move into shot and grinned, mouthing the words 'Hello Mum'. Then, a moment of sheer excitement. 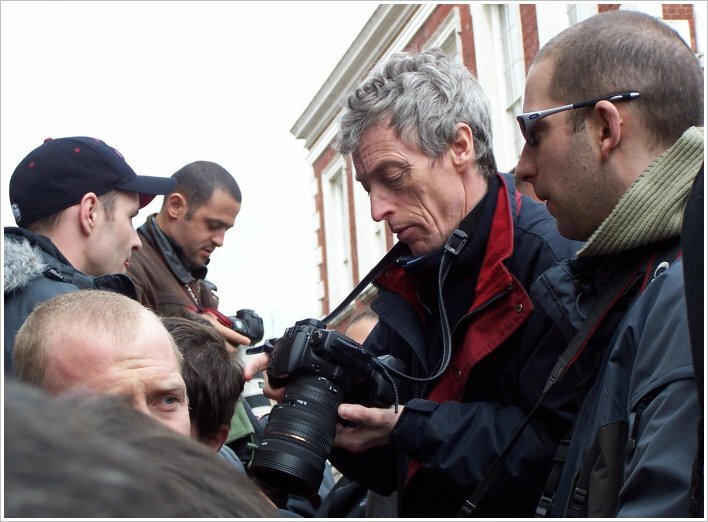 A BBC News crew with journalists I recognised. I fumbled for my digital camera, pointed and clicked. The image was blurred. My heart began to race. I pointed again...I managed to capture the fluorescent yellow jacket of a police officer who had the stupidity to walk in front of me at the wrong moment. Third time lucky...I clicked and pointed. And yes, I managed to get the side of her face.... With that I was momentarily content. At last, something to show my colleagues at work! Then I overheard words that will haunt me. It was a father talking to his son.
" No you don't want to stand here." He was pointing to my spot by the barrier. " This is the side of the Guildhall. The front entrance is round there! " Three hours of standing in the cold and I wasn't even in the correct spot? I made my way to the front of the Guildhall and found a row of photographers on ladders, and three rows of spectators behind them. I waited in hope that an opportunity would present itself for a photograph, but the cameramen closed ranks, their bodies removing all openings...except one. I cursed inwardly. Others cursed outwardly. But the cameramen were unrelenting. They had editors to please, deadlines to meet and they would not move for anyone! 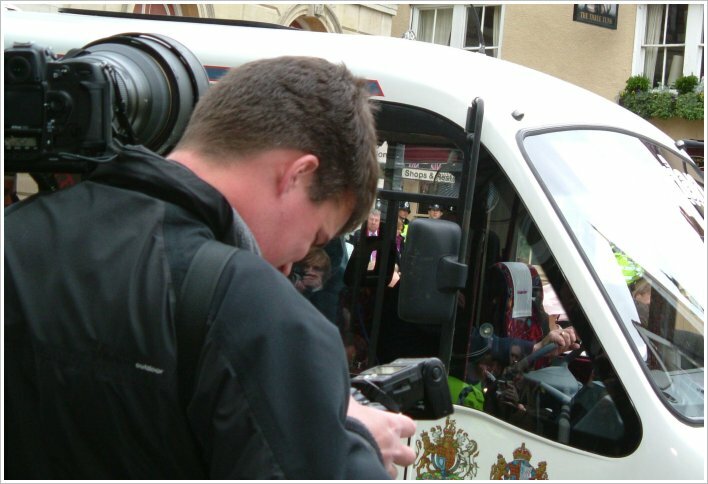 And so as the royal party arrived at the Guildhall in their opulent splendour, I was reduced to kneeling and desperately sticking my camera through the one available opening.... between the legs of the camera man directly in front of me. I clicked immediately.... (with the camera, not the camera man)....not knowing whether I had taken any useful pictures beyond those of the thigh and groin of the camera man. As exciting as some might have found such pictures, they were not the memories I particularly wanted of this occasion. 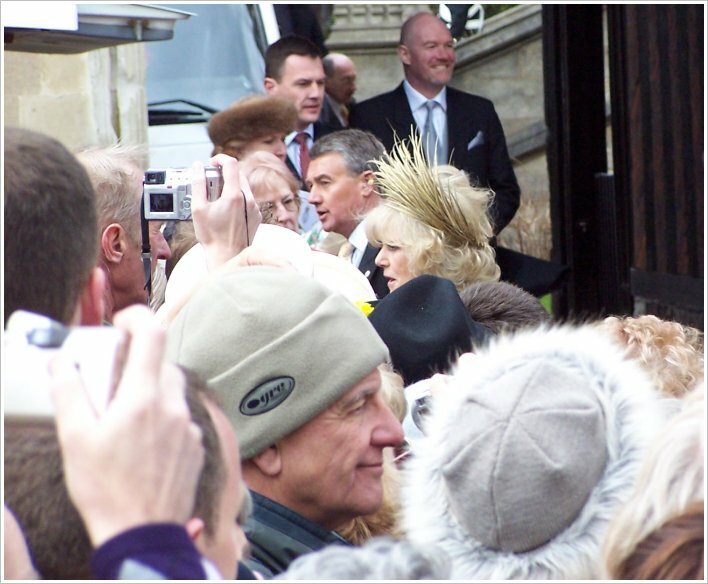 The hubbub subsided at the Prince Charles and Camilla entered the Guildhall and I waited the twenty minutes for the marriage ceremony to conclude in the hope of obtaining at least one good picture of them on the way out. However I was foiled again...this time, the cameraman kept his legs firmly shut. No joy to be had there! As I stood up, a German woman tapped me on the shoulder and asked me if I would pull my thermal hat down as she could not see. I bit my tongue. As if reducing my hat height by a quarter of an inch was going to make any difference! My saving grace, or so I thought, was the ticket for the viewing precinct of Windsor Castle. Surely here I would be able to get a good picture of the royal family! After all, admission was strictly limited! I battled my way through the crowds, only to be stopped by the sheer numbers of people. 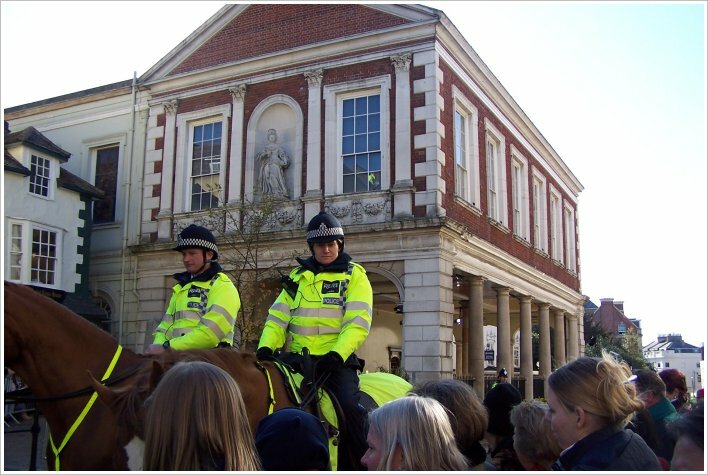 For twenty minutes police on horseback and teaming bodies kept me at a virtual standstill. Twenty police officers descended on streaker. I even failed to get a picture of this! Then a gap opened up and I made my way to King Henry VIII Gate leading into Windsor Castle viewing precinct. I confess for one small moment I felt particularly special. 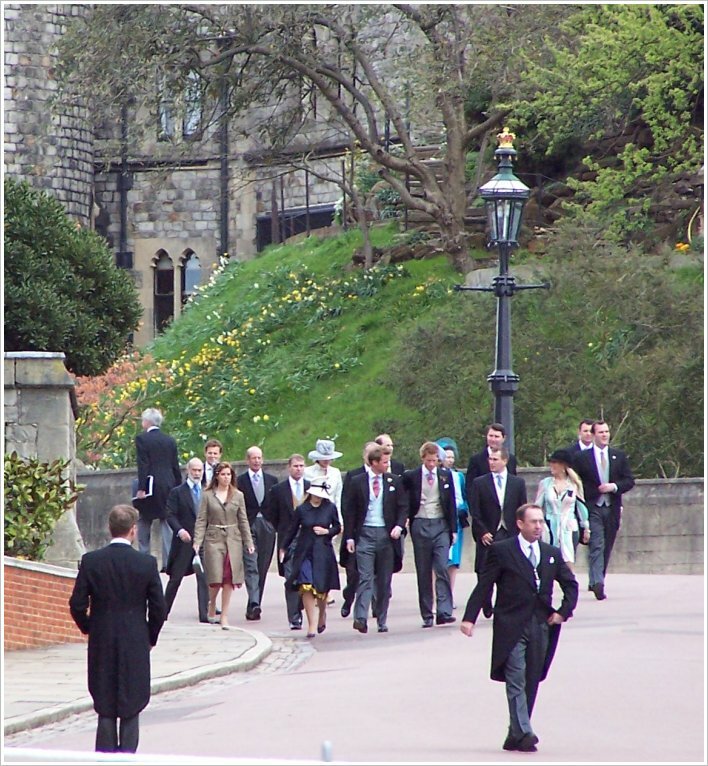 Thousands of people were kept at bay whilst the select few were taken through into the viewing precincts of the castle. 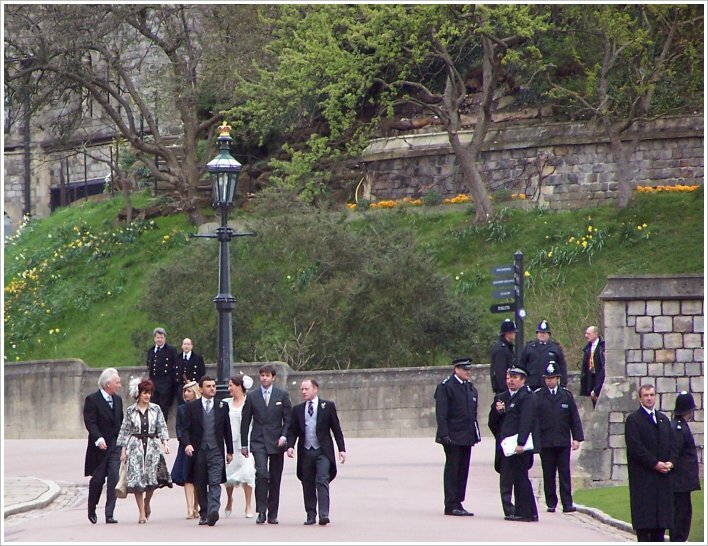 I even became excited as I managed to actually take a few pictures of the minor members of the royal family making their way to the Chapel. 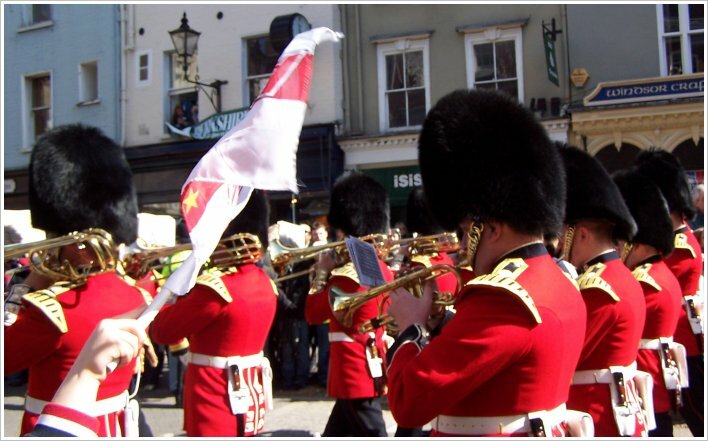 I stood though the royal service, relayed on large screens, and sang all the hymns heartily, if not somewhat off-key. Then the royal family posed for pictures....out of my view. Prince Charles and the now Duchess of Cornwall walked 10 feet away from me, but I was reduced to raising my camera above the head of the crowds in front of me and hoping for the best as I aimed and fired. And then, ten minutes later, it was over! I made my way back to my car and drove home. 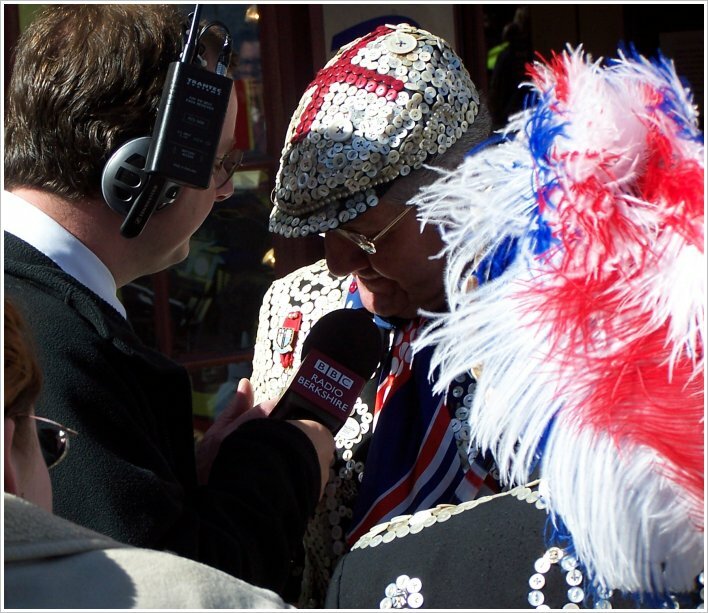 So to summarise, I drove nearly 300 miles in five hours, stood for eight hours, managed to get photographs of a camera man's thigh and bottom, Windsor Castle, one television journalist, one gay rights activist, a few minor royals and the tops of the heads of Prince Charles and his new wife. Additionally I managed to spot myself for 1.2 seconds on television grinning like an idiot into into a camera! In trying to see everything, I saw considerably less of the proceedings that I would have done had I stayed at home. Would I do it again? If you had asked me that question ten minutes after my return home, I would have uttered a few choice words. But now.....you know I think I jolly well would! I was there and no one can take that away! Here are a few pictures of the days events. Click on the thumbnails to enlarge and use the back arrow to return to this page. If you cannot see thumbnail pictures, check that you are not viewing this page in 'text only' version. All pictures should have a width of 708 pixels when opened, for optimal viewing. 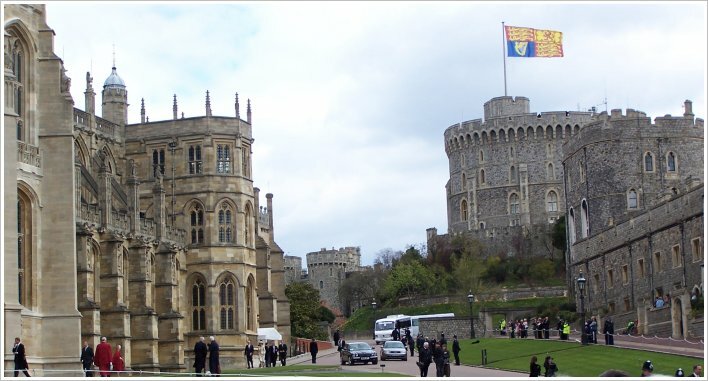 17th February 2005: The civil ceremony originally scheduled to be held at Windsor Castle will now take place at the Guildhall in Windsor, due to licencing problems. 23rd February 2005: The Queen states that she will not attend the civil wedding of her son. Clarence house states that this is not a snub. 23rd February 2005: Lord Chancellor forced to confirm that the wedding is legal. 18th March 2005: The Royal Mail has unveiled two stamps showing Prince Charles and Camilla Parker Bowles to mark their wedding. 22nd March 2005: Clarence House confirms that Camilla Parker Bowles wants the title of Princess Consort, when the Prince of Wales becomes King, rather than Queen. 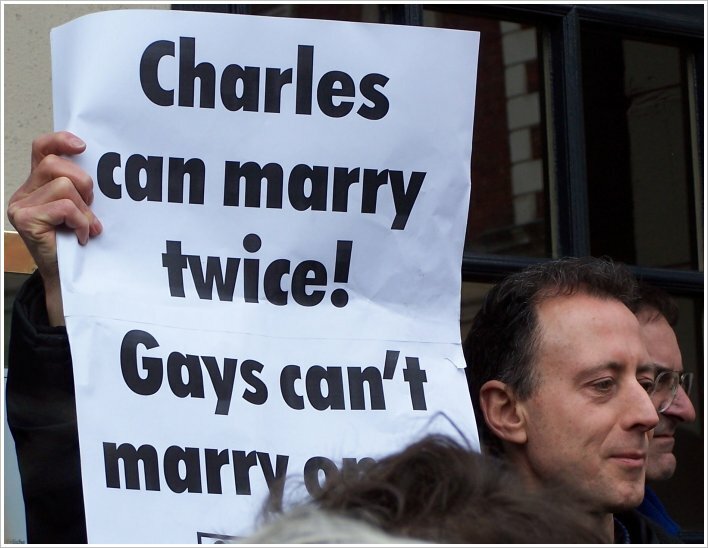 27th March 2005: A leading Church of England bishop, David Stancliffe, Bishop of Salisbury, has said Prince Charles must apologise to the former husband of his fiancee before their wedding on 8 April. 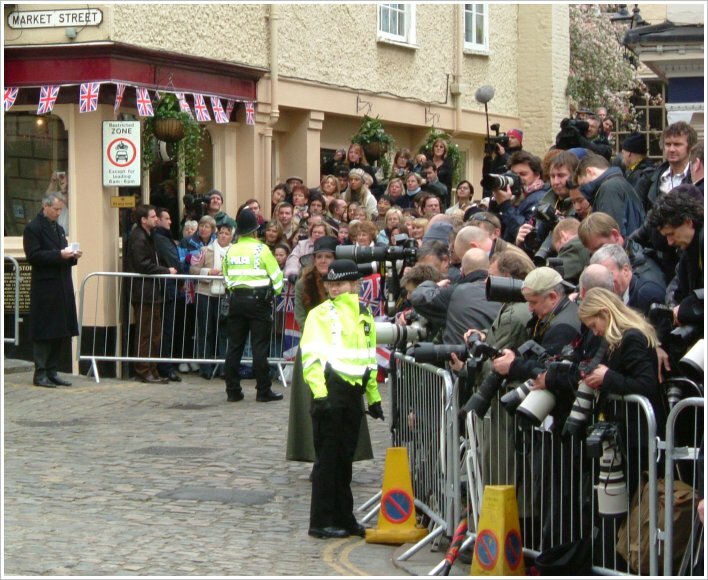 7th April 2005: A reporter posing as a delivery man drives a van with a fake 'bomb' past Windsor Castle guards in a breach of security. 8th April 2005: Blizzard conditions predicted for day of wedding. 9th April 2005: Wedding goes as planned...weather conditions good.